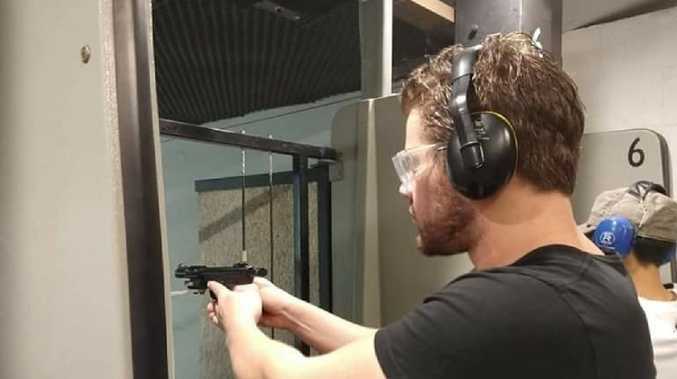 GOLD Coast man Eric Thomas, formerly known as Gable Tostee, has followed up social media posts about the Christchurch terrorist attacks with a picture of himself using a gun at a shooting range. Mr Thomas, 31, was acquitted of murder and manslaughter of New Zealander Warriena Wright, who fell to her death from Mr Thomas's apartment in 2014. 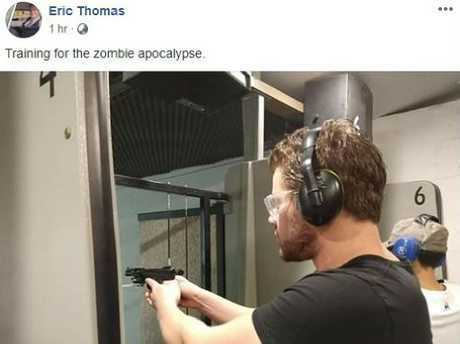 "Training for the zombie apocalypse," he wrote on his Facebook page. The accompanying photo shows Mr Thomas wearing ear muffs and protective glasses pointing a pistol at a shooting range. Eric Thomas, formerly known as Gable Tostee, posted this picture of himself using a gun on social media. "I think the one in the pic is a .22 pea shooter but also shot 9mm's and an old western .44 single action revolver," he wrote when asked what type of gun he was using. Mr Thomas referred to shooting as a "challenging and fun sport". The post comes after Mr Thomas spent the weekend writing social media posts about the terrorist attack in Christchurch which killed 50 people. "If it's ok to suggest that Islamic terrorism is the result of Western intervention in the Middle East, why is it totally unacceptable to question whether nationalist terrorism has been brewing as a result of unfettered mass immigration policies?" Mr Thomas wrote. Eric Thomas, formerly known as Gable Tostee, posted this on his Facebook account. He also posted a picture of New Zealand Prime Minister Jacinda Ardern wearing a headscarf. 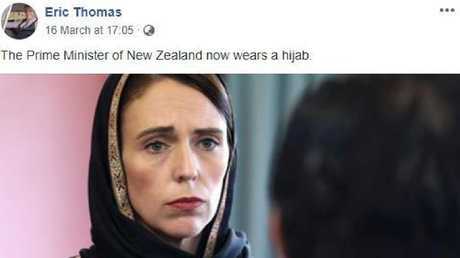 "The Prime Minister of New Zealand now wears a hijab," Mr Thomas captioned the post. 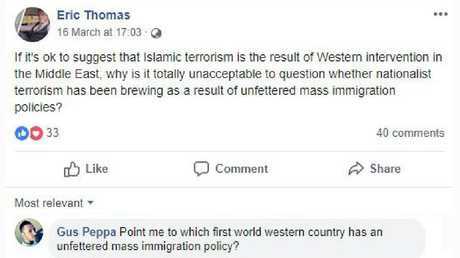 In the comments Mr Thomas said: "It's no secret that the left fetishises Islam and will use any opportunity to push the mass migration agenda. "It's not about respect, it's about politics." Mr Thomas also questioned the motives of the attack. "Yeah let's fight Islamic terrorism with more terrorism," he wrote followed by the eyeroll emoji. Earlier this year, Mr Thomas made headlines again after he suggested he had been vilified because of his gender. "If a man went to a woman's apartment, got himself blind drunk, became aggressive without any provocation and started violently attacking her, verbally abusing her, throwing her things at her, refused to leave and then attacked her with a piece of metal and then climbed off her 14th floor balcony after she managed to lock him outside in desperation, would she be charged with murder?," he wrote in January. 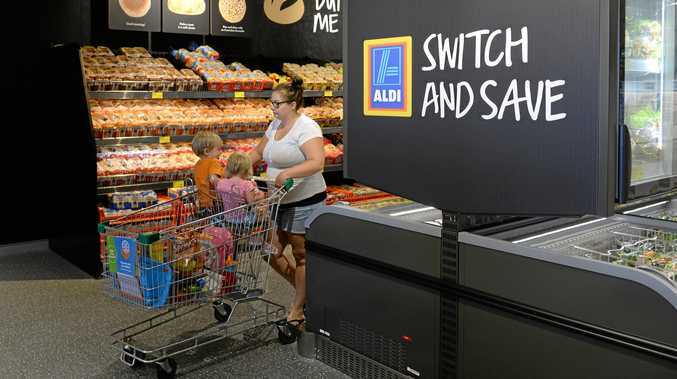 He has also posted photographs of himself with a "Make Australia Great Again" hat, a play on the phrase popularised by American President Donald Trump.